Is this the perfect tripod for digital cameras? 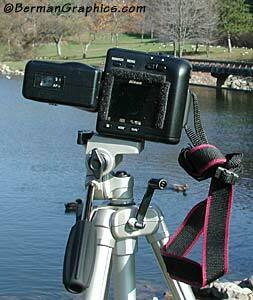 I never even considered using a light weight tripod before testing the Velbon Maxi 343E. It's light weight and sturdy construction makes it easy to take anywhere. Velbon Tripods are distributed by Hakuba. Velbon is one of those after market names I remember from about 30+ years ago when I first started shooting pictures. I was particularly impressed with the Maxi 343E tripod. It seems to be the perfect balance between size, weight, sturdiness and cost. 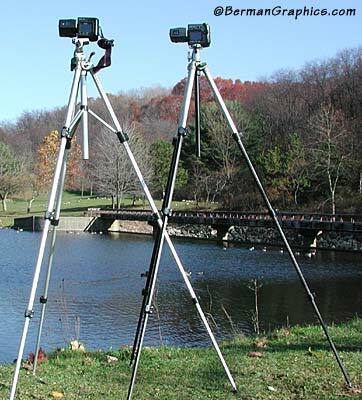 All metal construction and has the sturdiness of far heavier tripods. Always use the wider leg extensions before the narrow leg extensions as needed for a comfortable working height. Extend the center column about six inches and grasp it firmly with downward pressure with your left hand. Operate the camera with your right hand. I just finished shooting over 1800 pictures on a Southwest trip with the CoolPix 5000 (and CoolPix 950) using this Velbon 343E maxi tripod. Only three pictures from the entire trip had to be deleted due to unsharpness. And only because the tripod was settling into the sand at Monument Valley. Roger Hicks wrote a full page about the Velbon Maxi343E in the March 2002 issue of Shutterbug Magazine. "A while ago we were impressed with Larry Berman's story of his Southwest trip in which he relied on a lightweight but capable tripod from Velbon manufactured by Hakuba. That turns out to be the tripod Keppler fell in love with, too. Who are we to argue? The warranty is reassuring. 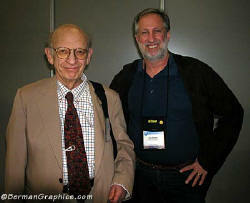 The pedigree (Berman and Keppler) is inspiring. But love has a mind of its own. And we did fall in love with this tough little tripod." 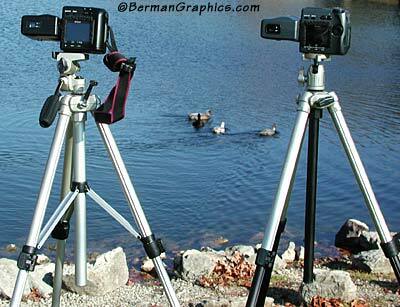 Velbon does make some inexpensive, light weight, but sturdy, tripods. It's approximately the same height but slightly sturdier. I do wish it came with a ball head though. 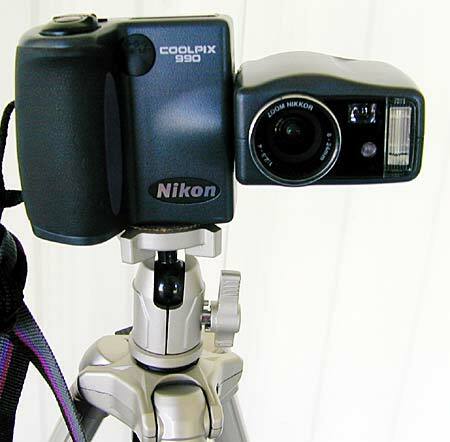 The pan head is awkward to use with the swivel body CoolPix as you can't lean the camera forward to look down through the LCD because the pan head handle hits you in the face. But for any other style camera it's easy to use. The pan head also contains an easy to use quick release plate. You can see that both tripods are extended to full height without using the extension of the center column. The 343 is 1/2 pound lighter. The 347 is one inch shorter when folder but one inch taller when fully extended. It also contains leg braces for added stability and a geared center column for more accurate camera positioning.